How often do you deal with garage door noises? How often do you have to replace rusty parts? There are reasons for these problems and certainly solutions. The best way to reduce loud noises and keep components free of rust for many years is lubrication maintenance. There is no need for you to exaggerate and lubricate components every other week. Excessive portions of lubricant will yield the opposite result. Most doors need annual or semi-annual lubrication in order to move smoothly. The right lubricants must be chosen and must be distributed properly for the avoidance of problems. So, let's discover the overall benefits of garage door lubrication. You may wonder why lubricants often reduce noises. It's simple. Garage door parts are made of steel and when steel comes in contact with other parts also made of steel, they make noise. Lubricants form a layer between them which protects the material and allows them to move smoother. The noise is automatically reduced. The material of the components is protected since their contact doesn't lead to splitting and scratches. When steel is scratched, it is damaged. It will erode faster and the dents created on the surface will produce louder noises. As a consequence, you will have to replace them soon or later. So, by lubricating parts, you protect them. They move easier, smoother and hardly make any noise. Since they are not damaged, they last longer. Since their material is protected by the lubricant, it won't corrode. You have to remember that all moving parts made of steel must be lubricated. Garage door springs need lubrication, too. Don't lubricate the rollers if they are made of nylon. It's also important to clean the parts well before you lubricate them. Debris and dust collected on all parts mixed with old and fresh lubricants will just make their movement stiff. 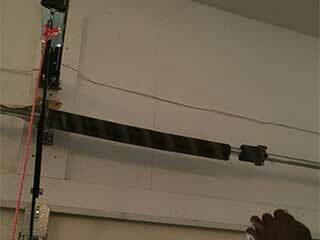 This is true especially for the garage door tracks, which are the rails rollers sit and move on. If they are dirty, the rollers won't move correctly and the door might jam. Don't use too much oil. Parts just need a couple of drops and good distribution of the lubricants. It's smart to run the overhead door up and down a few times so that lubricants will go in all parts. When you lubricate the springs, spray a few drops on them and then use your palm to oil the entire surface. Lubrication is the simplest and still most effective method to keep your door in good shape and noiseless.